Cowboy Cut posted a whomping 928 lb 205 adjusted weight and followed that with 1428 lb 365 adj weight, then posted 16.15 REA scan with 3.81 %IMF. 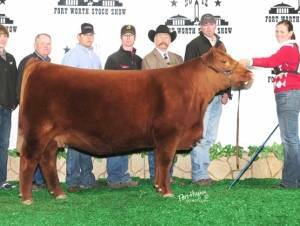 A total outcross pedigree in the US with lineage tracing to the great Angus female producer Whitestone Widespread. 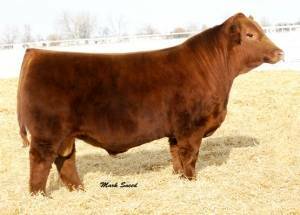 His Grandsire, Lazy MC Smash 41N was the NO. 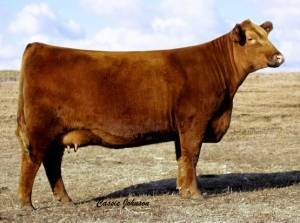 1 Red Angus bull for registrations in 2008 in Canada and sired the 2008 Canadian Angus Association Female of the Year. 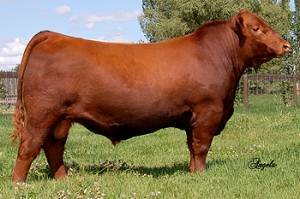 The first Cowboy Cut progeny to sell have been in great demand and they have competed superbly, winning many banners, including the 2012 & 2013 Champion at the NWSS Junior Red Angus Shows.